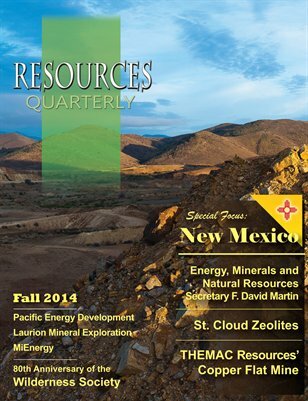 Our Fall 2014 issue brings you our special focus on the energy and natural resource abundance of the State of New Mexico, where we look at each of oil & gas, mining and renewable energy with special company profiles of St. Cloud Mining and THEMAC Resources' Copper Flat Mine. We also profile Laurion Mineral Exploration in Ontario, Saskatchewan's MiEnergy and California-based Pacific Energy Development. Also in this issue, the Wilderness Society, preparing to celebrate 80 years as we mark the 50th Anniversary of the signing of the U.S. Wilderness Act.